I joined the Air Force after a not-so-great year at Ohio State. 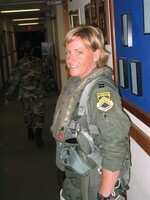 The AF was obviously the best decision I have ever made next to marrying my husband. 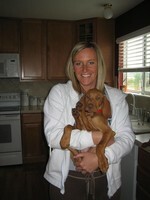 I retired last year after 21 years of service and my husband and we now live in DC with our two Vizslas. Beth Carpenter Subero has a birthday today. Getting geared up for my first F-16 flight. Was I nervous?